The one thing about travelling around Europe for most of 1998 (as I mentioned in Part 1) was that I had to take all my music with me. And, since iPods had yet to be invented, that meant a Walkman and a Discman, and only essential tapes and CDs. George Michael got himself in trouble all over again with "Outside"
I also amassed a substantial collection of vinyl 7" singles and 12" singles along the way - I recall the majority of my time spent in Bern, Switzerland was in an amazing second-hand record store - and that too had to be lugged around from country to country. In terms of new music, I kept track of the new songs I'd heard in my travel diary and anything I didn't buy on the road, I picked up when I arrived back in the UK at the end of the year. Yep, who cares about cathedrals and art galleries when there's music to discover? A song that had narrowly missed the UK top 40 back in 1994 received another lease of life (and a remix) in 1998 and reached a peak of number 27 second time around. Like many seemingly random remix and re-release attempts throughout the '90s, I'm not entirely sure what the reason was behind this reinvention - although it could have had something to do with the fact that The Fog's Ralph Falcón was enjoying some degree of success as part of Funky Green Dogs around the time. With the success of Shola Ama in 1997, British record companies started wheeling out their own young R&B/soul singers in 1998 - a list that included the next two artists we'll encounter. Tunisian-born Hinda cracked the UK top 30 with this, her second single, but despite each of her two subsequent singles improving on that performance, and a swag of MOBO and BRIT Award nominations coming her way, she was dropped by her record label in 2000. This wasn't Celetia Martin first single - she'd been releasing records for some years - but it was her first and only top 40 hit in the UK. That is, it was her only hit under her own steam. A couple of years later, she provided vocals for Groove Armada's "My Friend", which also (just) managed a spot in the British top 40. Some more British R&B - this time from a boy band who were the UK's answer to American acts like 112, Next and Jagged Edge (none of whom had much success in Britain). Debut single "Be Alone No More" even came with a guest appearance from rapper-on-the-rise Jay-Z, who'd yet to land a truly massive hit and probably thought this was a good idea at the time, even if now it feels fairly incongruous. By 1999, when "Be Alone No More" was remixed and re-released (as a double A-side with a cover of "Holding Back The Years"), Jay-Z's involvement was clearly deemed more important, since he received a featuring credit despite not having been given one for the initial release. Back to the dance floor with some German trance from duo Marc Romboy and Klaus Derichs. Released on the UK's Positiva label (I haven't mentioned that in a while! ), it was a minor chart hit in the UK, but one of my favourites from the genre in 1998. Other trance anthems to have just missed by top 100 including BT's "Flaming June" and "Café Del Mar 98" by Energy 52. Kitsch Eurodance act Aqua went all serious with this track from their Aquarium album, which was also used in the movie Sliding Doors. Proving, albeit for a brief moment, that they were capable of more than ultra-cheesy ditties like "Dr Jones", "My Oh My" and "Lollipop (Candyman)" (number 117 on this list), Aqua scored another UK number 1 and Australian top 10 hit with "Turn Back Time". There's a link to the Love To Infinity remix, to which I was quite partial, in the song title - and the video version below. In Part 1, I mentioned that David Morales received the Grammy Award for Remixer Of The Year for his work in 1998 - some of which we'll see in Part 3. But, for now, it's his biggest hit as a recording artist - which made liberal use of the 1976 Rare Pleasure track "Let Me Down Easy" as well as a vocal from The Chi-Lites' "My First Mistake". A top 10 hit in the UK, "Needin' U" would become "Needin' U II" three years later as a new version featuring Juliet Roberts on vocals. Originally released in 1990 by the dance group which featured Billie Ray Martin on vocals, "Talking With Myself" received an unexpected remix in 1998 thanks to Canny. In the intervening years, Billie Ray had enjoyed a relatively successful solo career (well, successful when compared to Electribe 101, who were never the biggest hitmakers) and so this was possibly trying to capitalise on that - but, despite this new version being way better than the original, it peaked 16 places lower on the UK chart at number 39. In 1998, half-sister Neneh and step-sister Titiyo were nowhere to be found, and so it was time for a new Cherry to make his mark on the music scene. With this debut single, Eagle-Eye did just that, scoring a top 10 US and UK hit. The song also reached number 11 in France, which is where I spent the month of July that year - and "Save Tonight" was played constantly. Eagle-Eye had one more major hit, "Falling In Love Again", but success dried up after that initial burst. Even a duet with Neneh on "Long Way Around" in 2000 failed to do the business. The third year in a row they score a place in my top 100 countdown - and, in 1998, Peach finally got around to releasing their debut album, Audiopeach. Previous singles "On My Own", "From This Moment On" and "Sorrow Town" were all included on the album, while this track had been planned as a single in 1997 but the release never went ahead. Since I found a promotional copy of the CD single in the UK in 1998, I figured it could count in my year-end countdown. In the pre-download era, my rule for including songs on my chart were that a single had to be released in some way, shape, form or country - and so this satisfied that requirement (in my mind, anyway). In Part 1, I mentioned that albums by Morcheeba and Air were de rigueur (OK, I didn't actually use those words) in 1998 - and here's my favourite song from the former. Big Calm was the second album by trip-hop trio Morcheeba, and although it never rose above number 18 in the UK, it did go platinum. And, although it didn't spawn a massive hit single - the tracks that were released (other than "The Sea", there was "Shoulder Holster", "Blindfold", "Let Me See" and "Part Of The Process") were all great singles. "The Sea" was probably most widely known in Britain thanks to its use in the 2000 reality series Shipwrecked, which aired in the UK before I returned home to Australia. Actually released as a double A-side with The Divine Comedy's version of "I've Been To A Marvellous Party" (although I wasn't a fan of that song), this collaboration between the British soul singer and the soundtrack composer was lifted from Twentieth-Century Blues, a tribute album to Noël Coward. Pet Shop Boy Neil Tennant put the project together and artists such as Robbie Williams, Texas and Elton John also contributed songs. "Someday I'll Find You" dated back to 1930 and Coward's play, Private Lives - and this update was quite the reinvention. Showing remarkable restraint, Janet only released six singles from her 1997 album The Velvet Rope (unlike the eight she'd lifted from Rhythm Nation 1814 and the nine from janet) - and this was the final track issued. It's likely no further singles followed since "Every Time" had the most disappointing chart performance of any single Janet had ever released (not including the singles from her pre-Control records). Still, it's a pretty song and probably would have been a top 10 hit at the start of the decade. Janet had more luck with the third and fourth singles from The Velvet Rope: "I Get Lonely" (number 73 on this list) and "Go Deep" (number 144). The fifth single was "You", which was only released in certain territories and would probably have been better left as an album track. Another random remix of a 1990 track - this time the debut single by the dance duo comprising producer Youth and singer Durga McBroom, who sounds like a character out of Harry Potter. Knob-twiddling duties this time were handled by Trouser Enthusiasts - and, like with the Electribe 101 track, I thought it was an improvement on the original, which had been a top 5 hit in the UK. The third and final single from the ex-Eternal member's second album, Woman In Me, was another fine pop track - but it did break Louise's strike rate of consecutive UK top 10 singles by only peaking at number 11 there. 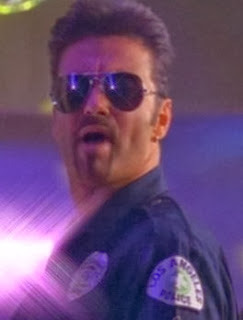 Making lemonade out of lemons - or something - George Michael turned his arrest for "engaging in a lewd act" into the subject of his controversial music video for "Outside", the lead single from his career retrospective collection, Ladies & Gentlemen. As a result of the arrest at a public bathroom in Los Angeles in April, George officially came out as a gay man - something that had long been rumoured but never confirmed before then. As well as satirising the incident in the "Outside" clip, he also laughed it off in interviews and emerged from the situation with his career intact - both "Outside" and Ladies & Gentlemen were big sellers that year. Not even a lawsuit brought by the arresting officer (who didn't take too kindly to images of policemen kissing in the "Outside" video) managed to stick. The denim-clad Irish jiggers had an amazing start to their short-lived, although recently revitalised, career. Their first four singles (including debut release "C'est La Vie", which we'll see in Part 4, and this follow-up) all entered the UK chart at number 1 - which is something not even Spice Girls had managed. Such momentum couldn't be sustained - but, in 1998, there was no stopping Keavy, Edele, Sinéad and Lindsay. The girls recently got back together for The Big Reunion, after clearly having one of the more quietly bitter break-ups of pop history. Before starting this countdown, I went back and listened to a lot of American chart hits from 1998 in case there was anything fantastic I'd missed while in Europe for the year. The short answer is: there wasn't. So much American soul and R&B from that time sounded tuneless to me - with acts like Xscape, Jon B, Total and Mya leaving me uninspired, not to mention all the hip-hop that seemed to lack strong hooks. One song to top the Billboard Hot 100 that I did like was this ballad by Jodeci members Cedric and Joel Hailey - but it was a song I already knew from 1998 since it had also reached number 1 in Australia and was a top 10 hit in the UK. No doubt the reason "All My Life", unlike so much American R&B from '98, crossed over to other countries is because it has a melody you can sing along to, instead of just a vague groove. Like Anastacia and Randy Crawford (to name a couple), American singer Lutricia was way more successful in Europe than back home - and had previously provided vocals for Swedish dance act Rob 'n' Raz before going solo in 1997. Her first single, "Ain't That Just The Way", was a big hit in the UK and on the continent, but I much preferred this follow-up, which was another top 10 hit in several countries. Ireland's second string boy band OTT had enjoyed a series of top 10 singles in their homeland in 1996 and then placed most of the same songs in the UK top 20 in 1997. In 1998, they lifted this track from their debut (and only) album, This One's For You - and although it was far and away their best effort, it would be their final single. We'll get to Part 3 after this week's usual ARIA recap - but you can expect some big European hits (from my time on the continent in 1998) and one of the best executed comebacks of all time.